What is the European Independent Living Day? The European Independent Living Day, celebrated on 5 May, is an annual event to raise awareness about the right to Independent Living and its importance for disabled people. 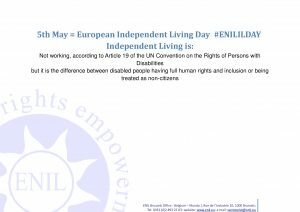 It was launched by the European Network on Independent Living (ENIL) in 2014 and each year the Independent Living supporters from many countries celebrate it by staging protests, launching reports, organising exhibitions and other awareness raising activities that target the general public. ENIL defines Independent Living as the daily demonstration of human rights-based disability policies. Independent living is possible through the combination of various environmental and individual factors that allow disabled people to have control over their own lives. This includes the opportunity to make real choices and decisions regarding where to live, with whom to live and how to live. Services must be available, accessible to all and provided on the basis of equal opportunity, free and informed consent and allowing disabled people flexibility in our daily life. Independent living requires that the built environment, transport and information are accessible, that there is availability of technical aids, access to personal assistance and/or community-based services. It is necessary to point out that independent living is for all disabled persons, regardless of the gender, age and the level of their support needs. No public money, at any level, should be used to build or renovate institutions for disabled people. Disabled people should be supported to live in the community and not locked away in institutions. We have seen the decimation of independent living. The closure of the Independent Living Fund, the cuts to local authorities, the forthcoming ESA 30% cut to those in the work related activity group from 2017, the change to PIP that has left many without support, cuts to Access to Work, and constant cases of those institutionalised who have died in a series of high profile cases-independent living isn’t working. The gains made by generations before us are being lost. But as disabled people we will continue to fight for independent living throughout Europe. This year, ENIL is encouraging everyone to take a photo with a sign ( download sign here) saying what Independent Living means to you. For those that prefer not to use their own photo we have a ready made sign.